USA’s Becky Block challenges with Canada’s Dana Dobbie during the World Cup Final at the 2017 FIL Rathbones Women’s Lacrosse World Cup, at Surrey Sports Park, Guildford, Surrey, UK, 22nd July 2017. 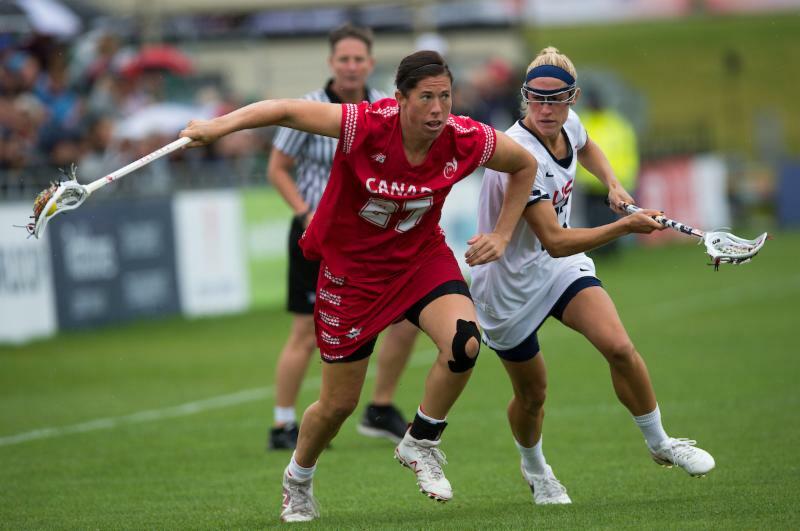 GUILDFORD, ENGLAND – Canada will bring home a silver from the 2017 FIL Rathbones Women’s Lacrosse World Cup after a 10-5 loss to the United States in a rain-soaked championship game at the Surrey Sports Park in Guildford, England. Despite a valiant effort – one that saw them limit a high powered offence that had scored 125 goals in seven games prior to the finals to a tournament low 10 goals – the Canadians fell short in their attempt to unseat the U.S., winners of eight World Cup titles, atop the podium. “All you can ask of your team is to leave everything on the field and walk off with no regrets, and we definitely did that today,” added team captain Dana Dobbie. While not the result they wanted, winning a silver medal is still an impressive accomplishment for the Canadian senior women’s team. It marks their third World Cup medal in-a-row and fourth overall, having previously won silver in 2013 and bronze in 2009 and 1982. After losing 17-3 to the U.S. during pool play, the Canadian coaching staff implemented a game plan to help slow down the pace of play, allowing them to keep up with a deep and talented American squad for a full 60 minutes. While they didn’t get the win, nor the start they wanted, their tactics allowed them to keep the score close. The U.S. opened the game with a flurry of goals, while Canada could only muster one from Dobbie, giving them a 5-1 lead at halftime. They would add onto that lead, scoring three straight to open the second half. With an 8-1 lead and less than 20 minutes to play, the game looked out of reach. However, a determined Canadian team did their best to make a game out of it. Their offence came to life mid-way through the second half, with two goals from Alie Jimerson and one from Erica Evans, cutting the U.S. lead to 8-4. While momentum was on their side at that point, the game clock was not. The Americans were content running it down to end the game, which forced Canada to use all their players, including the goalie, to pressure them in the hopes of causing a turnover. They were not successful, with the U.S. scoring two more easy goals, on a near empty net, to seal things up. Evans would add her second of the game in the dying minutes for Canada, but it was all for naught. Sarah Bullard, the game’s most valuable player, led the way for the Americans with a hat-trick, while teammates Marie McCool and Laura Zimmerman added two goals apiece. Alexandra Aust, Kaitlin Schwarzmann and Michelle Tumolo also found the score sheet, contributing one goal each. While disappointed with result, the veteran Dobbie, who was competing in her third World Cup, was able to see the loss in a positive light. Prior to receiving their medals, three Canadian players, attacker Dana Dobbie, midfielder Erica Evans, and goaltender Katie Donohoe, were named to the FIL All-World Team in recognition of their performances throughout the tournament. Dobbie, a vocal leader on the field and great ambassador off of it, collected 45/79 draw controls while also adding 22 points, while Evans, an NCAA standout, was the team’s leading goal scorer with 19 goals. The backbone of the team’s defense, Donohoe made 51 saves in seven games and was an integral part of Canada’s semifinal overtime win against Australia. Canadian team manager Fred Jenner was also recognized for his contributions and dedication to the team, receiving the organizing committee’s Heart of Lacrosse Award. A condensed roster will now make its way to Wroclaw, Poland, to compete in The World Games, marking the first time that women’s lacrosse will be part of an international multi-sport event.